A retrospective cross-sectional study found that despite the fact that continuing electroencephalography (cEEG) use was associated with lower in-hospital mortality in critically ill patients, cEEG is underutilized. Experts in critical care said the expense of the equipment and a dearth of professionals trained to use it properly are among the reasons why the assessment tool is underused. Continuous electroencephalography (cEEG) may be a useful tool to monitor and assess brain function in critically ill patients, including those with status epilepticus, cerebral ischemia, disorders of consciousness, and cardiac arrest, but it remains vastly underused, experts in neurocritical care told Neurology Today. In a retrospective cross-sectional study, a team of investigators in the University of Pennsylvania's department of neurology analyzed patterns of cEEG use from 2004 to 2013, finding a greater than tenfold increase in its utilization for critically ill patients over that time. Yet despite the fact that cEEG use was associated with lower in-hospital mortality for specific neurological diagnoses, they found it was underutilized: Only 0.3 percent of the critically ill population was assessed with the tool, the team reported in the November 30 online issue of Neurology. The study's authors noted that the American Clinical Neurophysiology Society has specified cEEG use for diagnosing seizures and/or status epilepticus, identifying cerebral ischemia, assessing level of consciousness, and prognosticating post–cardiac arrest. But the “effect of cEEG on outcomes for critically ill patients over the last decade has not been well characterized,” they wrote. Independent experts in neurocritical care agreed that the cEEG remains underutilized for a variety of reasons, not least among them the expense of the equipment and a dearth of professionals trained to use it properly. To that end, the investigators reviewed administrative claims from the National Inpatient Sample (made available by the Agency for Healthcare Research and Quality) of hospitalized adult patients who received intensive care. The investigators considered diagnostic subgroups of patients with seizure/status epilepticus, subarachnoid or intracerebral hemorrhage, and altered consciousness. Outcomes were available for in-hospital mortality, hospitalization cost, and length of stay. They compared outcomes data for patients who underwent cEEG with those who did not. Of the 7,102,399 critically ill patients identified by the study, 22,728, or 0.3 percent, underwent cEEG monitoring. Although the cEEG cohort seemed to be more ill, with higher comorbidity scores, more frequent palliative-care consultation, and longer lengths of stay than the control cohort, those who were monitored had lower in-hospital mortality after adjusting for patient and hospital characteristics (OR 0.83, 95 percent CI 0.75-0.93,p<0.001). The investigators said they suspect outcomes for the seizure/status epilepticus subgroup were probably confounded by disease severity, as higher mortality was observed in patients with status epilepticus who underwent cEEG compared with those given no cEEG. “Patients with lethal underlying etiologies of their seizures most likely do not benefit from further monitoring,” the authors wrote. Prior studies have shown that hospitals with larger bed size and urban teaching status correlate with greater cEEG use, Dr. Hill and her colleagues noted. They also pointed to tremendous variability in cEEG indication, initiation timing, length of use, and ensuing therapeutic interventions. Delineating optimal use in clinical practice will help limit variability in care and outcomes, they wrote. Neurologists interviewed by Neurology Today found the study to be useful in documenting trends in cEEG usage over the course of a decade and informing the direction of future research. “Even with adjustments for potential confounding elements, unknown variables may play a role in the study results, in which case cEEG's association with reduced mortality could represent “a halo effect,” said Stephan A. Mayer, MD, FCCM, William T. Gossett Endowed Chair of Neurology at the Henry Ford Health System in Detroit. Building and maintaining a robust cEEG-monitoring program presents another challenge, however. It requires a major investment in equipment and manpower, requiring technologists and physicians to be available to interpret readings 24 hours a day. “Smaller hospitals simply don't have enough of a critical mass for volume to justify the investment in cEEG monitoring,” Dr. Mayer said. Hospitals also may resist the expenses of round-the-clock staffing, which is necessary to meet the demands of such labor-intensive monitoring, said Marc R. Nuwer, MD, PhD, FAAN, professor and vice chair in the department of neurology at David Geffen School of Medicine at UCLA. Typically a technologist or nurse will watch a patient continuously from a remote location, Dr. Nuwer said, and call the physician for review of the record upon noticing a change, such as a seizure. Some simple-to-apply techniques have received approval from the US Food and Drug Administration (FDA), in fact, and do not require a technologist to secure them. These software alternatives only cover part of the scalp, however, and last at most a day before a technologist needs to hook up real EEG electrodes, Dr. Nuwer said. When cEEG is done correctly, however, it reduces the amount of time patients spend in intensive care units, resulting in significant cost savings to hospitals. And as cEEG monitoring continues to expand, the training of EEG readers has been making inroads in fellowship programs, noted Dr. Nuwer, particularly in clinical neurophysiology. Interpretation of cEEG is a fairly intensive process for the neurologist; Dr. Nuwer reads an ICU record two to three times each day and leaves a note in the patient's chart each time. Whenever he sees abrupt changes that need attention, he phones or pages the ICU physician caring for the patient. “Many EEGers may not wish to devote that much time to the service, so there is pushback about not wanting to do so much intensive work,” he said. And with a shortage of neurologists with relevant training, providing timely feedback to referring physicians is as challenging as it is essential. It is pointless to undertake such studies if the necessary interpretation occurs three or four weeks after the fact, said Jerzy P. Szaflarski, MD, PhD, professor and director of the Epilepsy Center in the department of neurology at the University of Alabama at Birmingham. The software packages with embedded capabilities to detect seizures in the cEEG are only 60 to 70 percent sensitive and specific. “We are far from the point where we will be able to use machines to reliably review the EEGs,” Dr. Szaflarski said. From 2004 to 2013, the proportion of patients who received cEEG increased from 0.06 percent (95 percent CI 0.03-0.09) to 0.80 percent (95 percent CI 0.62-0.98). Mortality for patients with subarachnoid or intracerebral hemorrhage was 26.3 percent for those monitored with cEEG versus 54 percent (p=0.005) for those who were not monitored with cEEG. Mortality for those with altered consciousness was 21.5 percent for the cEEG group versus 28.3 percent (p=0.001) for the non–cEEG group. Mortality in the status epilepticus subgroup was 18.2 percent for those who were monitored with cEEG versus 28.3 percent who were not monitored (p<0.001). •. Hill CE, Blank LJ, Thibault D. Continuous EEG is associated with favorable hospitalization outcomes for critically ill patients http://n.neurology.org/content/early/2018/11/30/WNL.0000000000006689. Neurology 2018; Epub 2018 Nov 30. 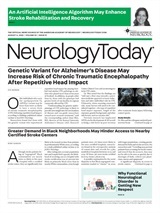 Neurology Today18(24):18-19, December 20, 2018.